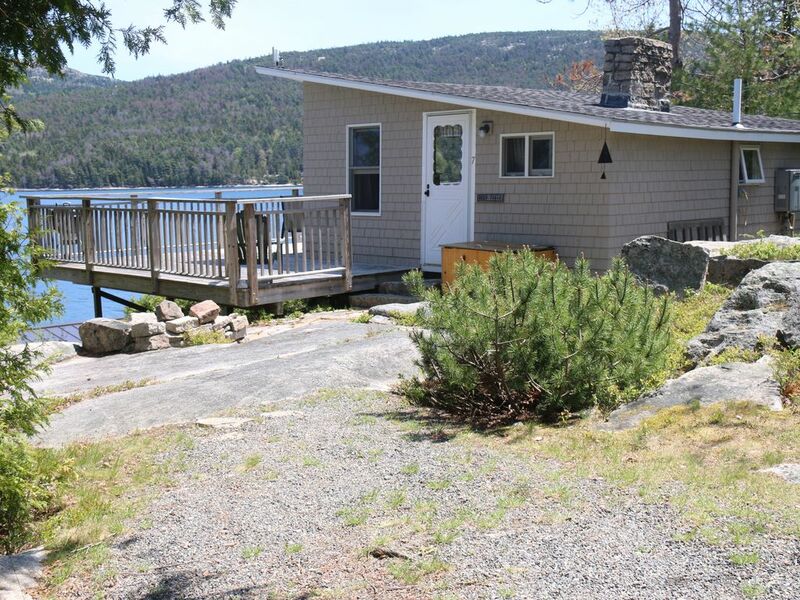 Deer Track is located on a hill overlooking Somes Sound, a natural glacial fjord, you will enjoy an unbelievable view of Sargent and Parkman Mountain. Nestled in the woods, this cabin is perfect for those who are looking for a quiet area that is centrally located to all major towns and attractions. Deer Track is perfect for 2 people, but can accommodate more with a futon for extra sleeping. On chilly evenings, cuddle up with a fire in the granite fireplace. Deer Track is really a perfect spot for a couple. My wife and I truly enjoyed our week. The location is centrally located to everything that MDI has to offer. The view from the deck is out of this world (I really don't think photos do it justice). Maria was so friendly and accomodating...thank you! I'm glad you had a good time and hope it doesn't take you another 5 years before we see you again. A little piece of Heaven! Perfect for 3. The view from our deck was stunning & magical. Who needs a TV when you can sit on the deck and watch the sail boats & lobster boats go by. The owners thought of everything you would need for a weeks stay. Clean, comfortable,cozy and just plain cute! My grand daughter who is 21 fell in love with this cabin and wants to live there! We 3 ladies had a great time staying here and exploring Acadia National Park, Bar Harbor, Bass Harbor, Whale & Puffin watching, and surrounding areas. We're discussing a return trip in the near future & will stay here again. Depending on how many family members will come, we will have to rent one of the other 2 cabins on their properties. Larger and accomadates more people. Great Time, place & owners are great folks! It`s a wonderful cabin with stunning views. The owners are very welcoming and friendly. The cabin is cosy and comfortable. Acadia national park is close by. Really everything you need for a holiday in Maine. We gladly come back year after year. Awesome stay. Peaceful, close to great trails and restaurants. Owners are super nice It was very clean and comfy. We enjoyed sitting on the deck. We booked for next year already. We have stayed in this cottage for several years, always in mid-June, for 2 weeks. View is spectacular, location is quiet and yet close enough to town. Mimi and Rick--the hosts--are friendly and available with information but they also respect guests' privacy. Cottage is well equipped for simple cooking and bed is supremely comfortable. We spend most of our time on the beautiful deck reading, or hiking the many trails on MDI. Deer Track is centrally located to any of the attractions of Mount Desert Island: Echo Lake, Acadia Mountain, Southwest Harbor and the “Quiet Side”, Northeast Harbor, Bar Harbor, Cadillac Mountain, and the Carriage Roads and Hiking Trails of Acadia National Park. Acadia National Park, which makes up a majority of Mount Desert Island, has some of the best hiking trails and vistas on the East Coast. It also offers nature walks, naturalist cruises and lectures. Golf at any one of three courses located on the Island. Enjoy sailing, swimming and fishing in either the ocean or fresh water lakes close by. In season you can pick blueberries on the grounds for your enjoyment. Weekly Rates from $800 - $1500 per week I have a no refund policy, however, if I am able to re-rent your week, I'll give you a full refund less a $100 cancellation fee. The more time you can give me when cancelling, the better the chances of getting your money returned to you.